Many steel parts are being galvanized in order to increase their resistance to corrosive factors such as air and moisture. Galvanization is coating a metal with a layer of zinc as a protective coating. The zinc layer in a galvanized steel will protect the steel from rust and corrosion, that's why the thickness of this layer is important. Manufacturers often need to test a galvanized metal to ensure sufficient amount of zinc is protecting the under laying metal. In this project you will test and measure the thickness of the zinc layer on a piece of galvanized metal. 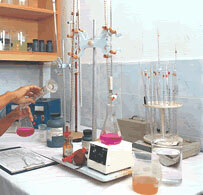 You will design experiments, perform tests and report the result. Thickness of the zinc layer or any other coating can be measured with many different methods, however in this project you will use the chemical method of measuring the thickness of the zinc layer. More details or support on this project is available for the members of ScienceProject.com. Material needed for experiment may be purchased locally or from online stores such as MiniScience.com.